Happy Nonfiction Monday! Yep, it's still February. Still Black History Month (are you checking out 28 Days Later over at The Brown Bookshelf?!). But March is right around the corner. And as we librarians know, planning ahead is your friend! Amelia Earhart by Tanya Lee Stone. Grades 4-7. Amelia Earhart flew solo across the Atlantic and she disappeared while attempting to fly around the world. Y'all knew that, right? Well, did you also know that besides being a pilot, Earhart was also (at various times) a social worker, a truck driver, a nurse's assistant, and a writer for Cosmo? Did you know that today only 6% of licensed pilots are women? Did you know that some theories about Earhart's disappearance say she might have been a spy or that she might have been captured by the Japanese? This DK biography is spiced up with colorful photos on every page. Having those visuals really made me feel like I was stepping into Amelia Earhart's life and times. The fact of Earhart's disappearance is enough to make the book appealing and lots of other information is presented in an accessible way. A Whole New Ball Game by Sue Macy. Grades 4 and up. You know the movie A League of Their Own? Want to get the real scoop on the All American Girls' Professional Baseball League? Look no further. This book tells the story of the league from its inception in 1943 to its disbandment in 1954. It tells the story of the young women who loved baseball so much that they played in skirts, rode buses all night to play double headers the next morning, and would NOT let themselves fade into the annals of history. Tons of photos break up the text nicely and there's a chronology, source notes, suggestions for further reading, and an index. Although I found this book to be readable and interesting enough for pleasure reading, it would make a great research tool as well. Unfortunately, black women weren't allowed into the AAGPBL, but this next book shows you that some of them played baseball anyway. A Strong Right Arm: The Story of Mamie "Peanut" Johnson by Michelle Y. Green. Grades 4-6. Girls Think of Everything: Stories of Ingenious Inventions by Women by Catherine Thimmesh. Grades 4 and up. What do chocolate chip cookies, windshield wipers, Liquid Paper, and flat-bottomed paper bags all have in common? They were all invented by women. Girls Think of Everything gives a glimpse at some of the many, many products invented by women. In some cases, women weren't allowed to patent their own inventions. In some cases, they had to fight to keep their ideas from being patented by men. In some cases, they weren't even allowed in the factories to oversee their own products being produced. But thank goodness women kept inventing things. Each entry in this book is 2-4 pages and accompanied by a colorful collage-ish illustration by Melissa Sweet. It's just enough information to give an overview, but not so much that the book gets bogged down by text. A list of source notes and suggestions for further reading are included in the back of the book. 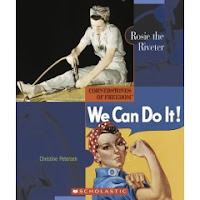 Rosie the Riveter by Christine Petersen. Grades 4 and up. When you think about Rosie the Riveter, what do you think of? I think of women working in the factories in World War II. And yes, Rosie the Riveter was a publicity scheme to attract housewives to work in ordnance factories during the war. But did you know that women had lots of other jobs during the war? They drove ambulances, pumped gas, ran shops, and fought fires (among many other things!). They were even recruited to join the Army, Marines, and Air Force where they performed such jobs as radio operating, typing, and even flying planes. This book gives a short overview of World War II and America's involvement. It examines different jobs women had during WWII and includes many photographs on every page. The photos really contribute to the book and show what it was like to live and work during this time period. Included at the end are a glossary, a timeline, an index, and a list of resources for more information. Interesting and informative, this is a great book about a significant period in women's history. This is one in a fun, fun series by Scholastic. It's filled with cartoon illustrations and gives an overview of Cleopatra's life from childhood to her death. Sidebars (side-cartoons?) give facts about Egyptian life and culture, the people in Cleopatra's life, etc. This isn't a research book, but it's lots of fun. The You Wouldn't Want... series has been pretty popular with 2nd and 3rd grade classes at the library, but I think it can have appeal for older kids who are interested in the topic. And there you have it. These are the nonfiction Women's History Month titles I'll be taking with me on March 3... What would you add to this list? What other great books about women might be appealing to boys, too? Do be sure to check out the Amelia Bloomer Project, which includes lists of great books that celebrate women for all ages. Also, there's a recent post over at INK that points out some interesting books about remarkable women.